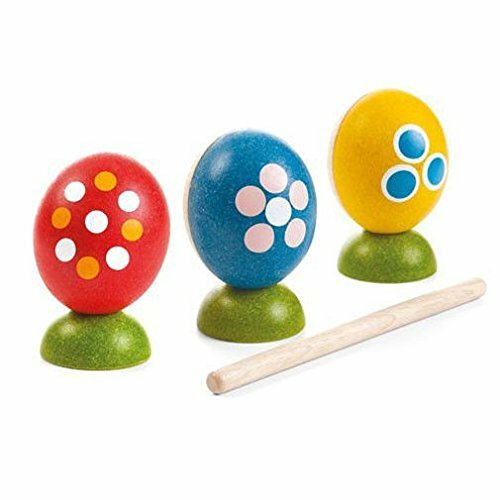 This set of three guiro and shaker eggs create a wide variety of sounds whenscraped, hit or shaken. Stick is included. Made in PlanWood. For more than 30years, PlanToys has been consistently developing its products and activitieswith a strong commitment to contribute positively to the world. Byimplementing best practices and taking innovation of toy-making and design tothe next level, PlanToys is not only known as being the first company tomanufacture wooden toys from preservative-free rubber wood, we are a leadingcompany that has created a new material and process as part of our zero wastegoals. Continuing our commitment for a sustainable future, PlanToys hasintroduced PlanWood as another high quality, safe, and sustainable material inour toy-making process. This material will be used in harmony with our solidrubber wood. PlanWood is an eco-friendly material because the waste isminimized and fewer trees are reclaimed. The less energy, used to producePlanWood ultimately reduces our environmental impact. PlanToys values havebeen rooted from embracing Mother Nature. The company has grown their greenvalues into values of Sustainable Play. Sustainable Play is the foundation ofhow our toys cultivate creative minds and bring children closer to nature.